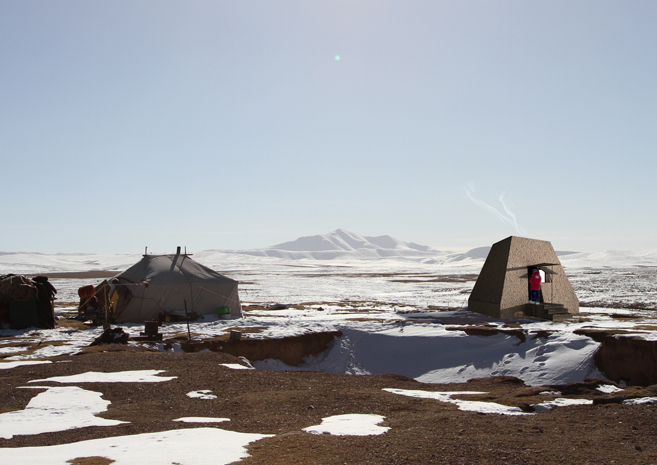 The task was to design a small-scale infrastructure for wildlife/environmental monitoring and patrolling for the Sanjiangyuan National Nature Reserve in China. 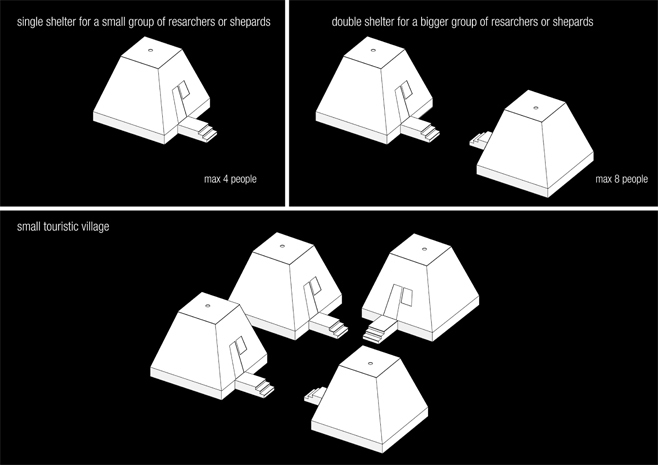 The requests of the commissioner have been very precise: the shelter would host groups of researchers and possibly shepards for short periods, ranging from 2 to 6 days. 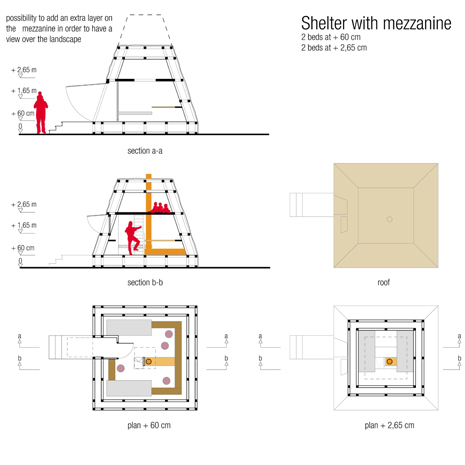 Depending on the needs and possibilities it is expected to build more shelters of the same type over the years in order to provide the entire park with facilities for the development of scientific and natural research and at the same time shepherding. 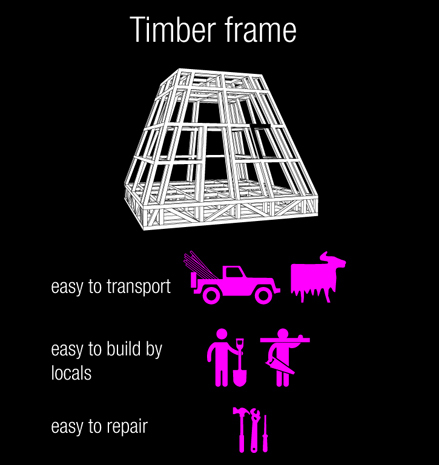 To give an answer to all the requirements, the team has chosen the following project initiatives: first of all we chose a wood structure, as it is easy to transport, assemble by locals and eventually to repair. Given the abundance of straw in the region we opted for the use of this material as thermal insulation. 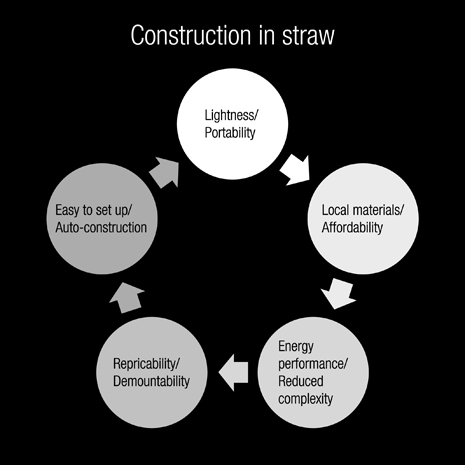 Straw is in fact the best natural thermal insulation when the wall thickness filled by it reaches approximately 35-45 cm, in which case, it equals industrial thermal insulation. 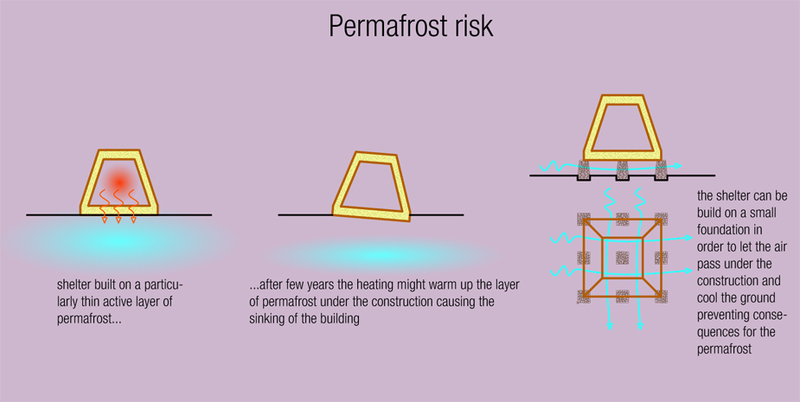 This solution has proved particularly congenial as many local homes are insulated with straw covered with a layer of clay on the roofs and sometimes on the walls. 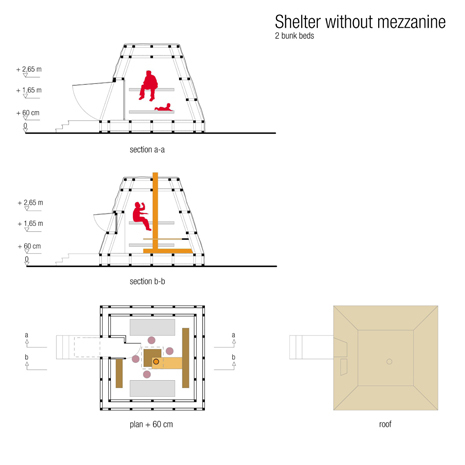 For this reason, the use of straw and clay met the requirement for a shelter in perfect harmony with nature and the local landscape. In order to reduce the volume that needed to be heated we opted for a pyramidal structure where, with an equal floor area, the internal volume of the shelter is minimised. 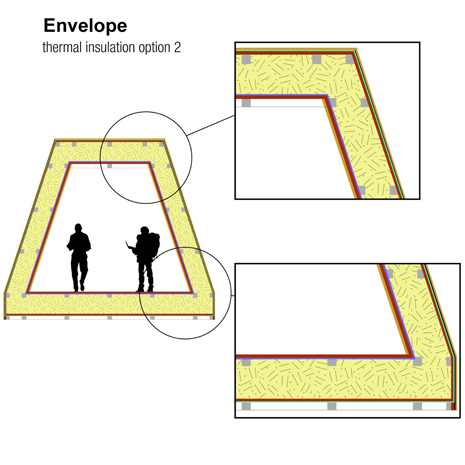 The sloping walls of the shelter reduce the flat area of the roof and thus the pressure loads on the structure due to the accumulation of snow. 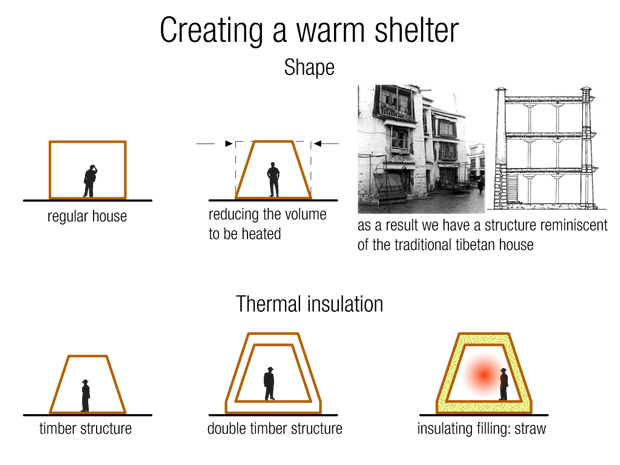 From the morphological point of view it needs to be noted that traditional Tibetan houses have sloping walls, therefore the adoption of this form contributes to the harmonic inclusion of the shelter in the surrounding landscape. 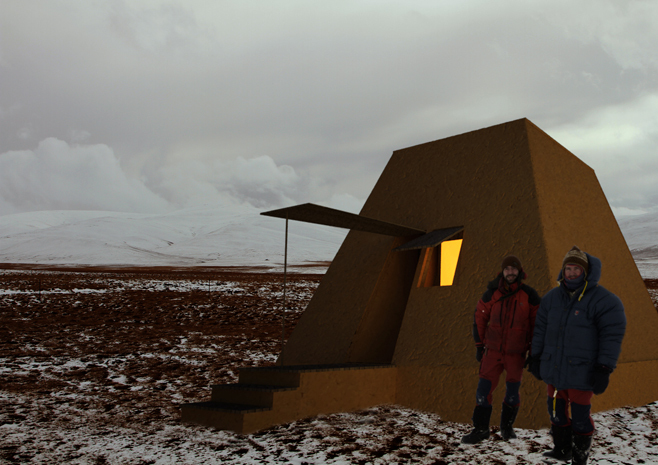 The extreme simplicity of transport and construction allows for reproducibility of the shelter anywhere in the vast nature reserve. Clusters of shelters can also be placed in strategic points of the park to form small touristic resorts in perfect harmony with nature.